Final Touch bring you your favourite top hits from the 70’s, 80’s, 90’s and 00’s, through the wonderful decades of Rock’n’Roll, Pop, Rock and Disco music. 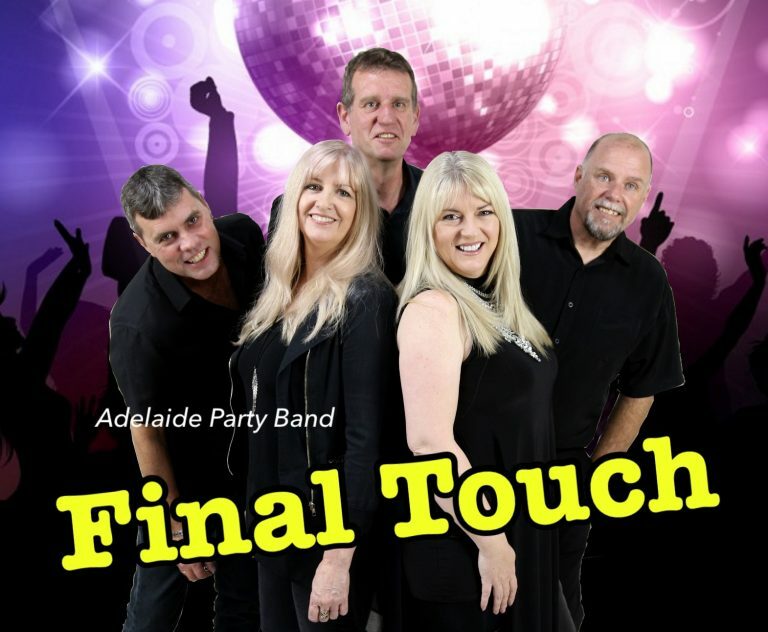 Guaranteed to have you singing and struttin’ your stuff on the dancefloor, Final Touch deliver the hits with a fresh, clean sound that will leave a lasting impression! We have performed for many Venues, Private Functions and Corporate Events and pride ourselves on delivering a fun, friendly and Interactive night for all. Dance the night away with our interactive show, to your favourite tunes from Abba, The Beatles, Fleetwood Mac, Boz Scaggs, Michael Jackson, Madonna, KC & The Sunshine Band, Bruno Mars, Divinyls, Maroon 5, Bon Jovi, Van Halen, Wham, Cold Chisel, Blondie, Bee Gees and many more. We also have a show that we offer with our Shagadelic 60’s/70’s Hippie outfits and our Fluro 80’s/90’s Disco Rock outfits. Performing on the 2018 Cruise and Groove ‘Radiance Of The Seas’ cruise ship, Woolworths Distribution Centre Event, Coles Distribution Centre Function and Leconfield Winery just to name a few. Cathy on lead vocals- a great infectious stage presence with a powerhouse voice that really packs a punch. Cathy really loves to work with the crowd and thrives on being very interactive with her audience. Trace on keyboards- this lady really knows how to make her keyboards sing. Rob on bass/vocals- His passion for music shines when he performs on stage. Giles on guitar- loves performing and really embraces every gig with energy and enthusiasm. Steve on drums – he’s our silent achiever always sporting his poker face but loving every minute but we can always get that sneaky grin out of him though. All of our members have many years of experience in the music industry and pride ourselves on being punctual, professional and passionate about every show we do.